Illustration of graphene-based SNP detection chip wirelessly transmitting signal to a smartphone. Credit: Lal et al. The chip essentially captures a strand of DNA containing a specific SNP mutation and then produces an electrical signal that is sent wirelessly to a mobile device. It consists of a graphene field effect transistor with a specially engineered piece of double stranded DNA attached to the surface. This piece of DNA is bent near the middle and shaped like a pair of tweezers. One side of these so-called "DNA-tweezers" codes for a specific SNP. 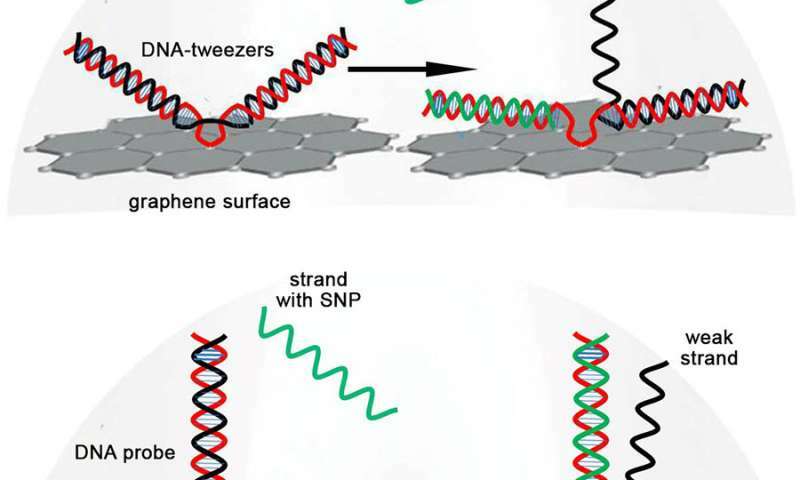 Whenever a DNA strand with that SNP approaches, it binds to that side of the DNA-tweezers, opening them up and creating a change in electrical current that is detected by the graphene field effect transistor. What drives this technology is a molecular process called DNA strand displacement—when a DNA double helix exchanges one of its strands for a new complementary strand. In this case, the DNA-tweezers swap one their strands for one with a particular SNP.